1894 is in very good condition, the sight riser is the only missing part. Lever, hammer, trigger, are all crisp and strong action. I let someone who wanted to check it out from Craigslist try it out and it was firing fine for over 25 shots. This is the blued finish with the plastic stock. 1938B has been in the family and in the box since the 80's. 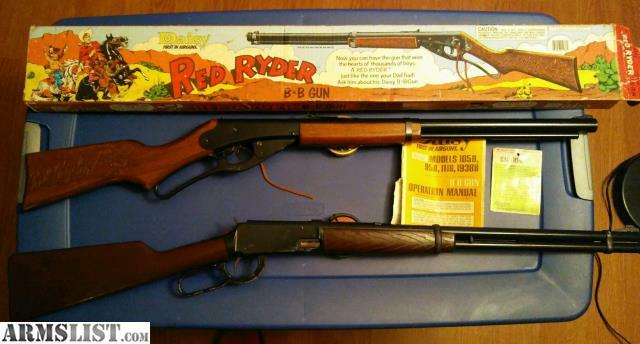 As far as I know it's unfired and in excellent condition with the Red Ryder and Little Buck Box. Some of the paper work it still with it but has been rolled for a time with a tear on the back of the owners manual. No shipping. Smoke Free - Pet Free Home.